See why Indianapolis Colts chose Exclaimer to streamline their email signatures, while migrating to Office 365 from Exchange on-premises. Indianapolis Colts, also known as the Colts, are an American football team that compete in the National Football League (NFL), the highest professional level of American football in the world. Currently based in Indianapolis, Indiana, the Colts were originally founded in Baltimore, Maryland in 1953 where they won two Championship games and one Super Bowl game. Since relocating to Indianapolis, the Colts have won a further three championships and one Super Bowl game. Exclaimer’s solutions have been flawless; the whole organization now has uniform signatures. Branding for any NFL team is a huge part of their identity, Indianapolis Colts are a team who take pride in their blue and white colors, and their horseshoe logo. 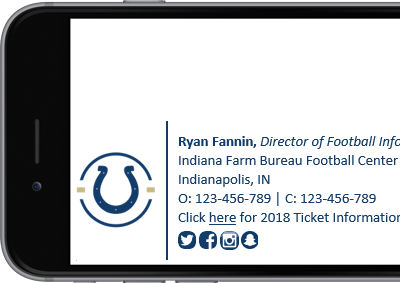 The Colts’ brand is internationally recognized, which makes it essential for their branding to be consistent across the board, including in corporate communication. At the time, Indianapolis Colts were in the process of migrating from on-premises Exchange to Exchange Online. This meant that they needed to implement a hybrid setup of Exclaimer Cloud - Signatures for Office 365 and Exclaimer Signature Manager Exchange Edition.